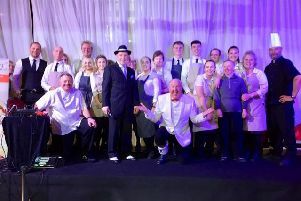 Thirty years treading the boards of amateur theatre and this week the cast of Garstang Musical Productions bring to the stageone of their most ambitious shows yet. Garstang Musical Productions present hit musical Sister Act, with curtains up on a four-night run at Garstang Community Academy from tonight (October 19) until Saturday October 22. Following in the footsteps of Whoopi Goldberg Steph Anderson steps into role as as Deloris Van Cartier, a rising 1970s singer who witnesses her smooth lover Curtis murder a police informer. Fearing for her life, the police place her in witness protection in a run-down Philadelphia convent under the guise of Sister Mary Clarence. The stage production features numerous toe tapping tunes including Take Me to Heaven’ and Raise Your Voice’, performed by a great ensemble of singing nuns along with fabulous dance routines. Chairman of the group Jo Fagan said: “We are very much a community group putting on shows for the community. The show runs from Wednesday, October 19, to Saturday, October 22 at Garstang Community Academy on Garstang Road, with doors opening at 7pm for a 7.30pm start. There is also a matinee on October 22 at 2pm. Tickets are £10 and may be purchased from Car Care, High Street, Garstang. Don’t miss out on a fantastic night.